Cardio-Oncology is the cardiac care of cancer patients. With the advent of newer therapies there has been a dramatic improvement in life expectancy. However as many of these treatments have cardiac side effects, there has been an increase in cancer patients with a variety of heart diseases (heart failure, ischaemic heart disease, arrhythmias, valvular heart disease, hypertension and arterial and venous thrombosis. Cardio-Oncology is the care of cancer patients with cardiovascular disease .While it has been a speciality for a few years in the USA and in some parts of Europe, it is in its infancy in the UK. However the speciality is rapidly expanding in the UK with a number of hospitals developing Cardio-Oncology services. This review aims to give the reader an overview of the exciting new specialty of Cardio-Oncology. The mortality rate among patients with cancer has decreased dramatically over the last 20 to 30 years. However, the toxicity of conventional cancer treatment (both chemotherapy and radiotherapy) is greater than previously appreciated and is a leading cause of morbidity and mortality in survivors . New ‘targeted therapies’ are being developed at a rapid pace many of which have recognised or unrecognised cardiovascular toxicities. The cardiac toxicities of cancer treatment include heart failure, cardiac ischaemia, arrhythmias, pericarditis, valve disease and fibrosis of the pericardium and myocardium (Figure 1). Chemotherapeutic agents can broadly be divided into cytotoxic agents (anthracyclines e.g. Doxorubicin, taxanes e.g. Paclitaxel and others like 5 Fluorouracil, Cyclophosphamide and Cisplatin) and molecular targeted therapy [Monoclonal antibodies e.g. 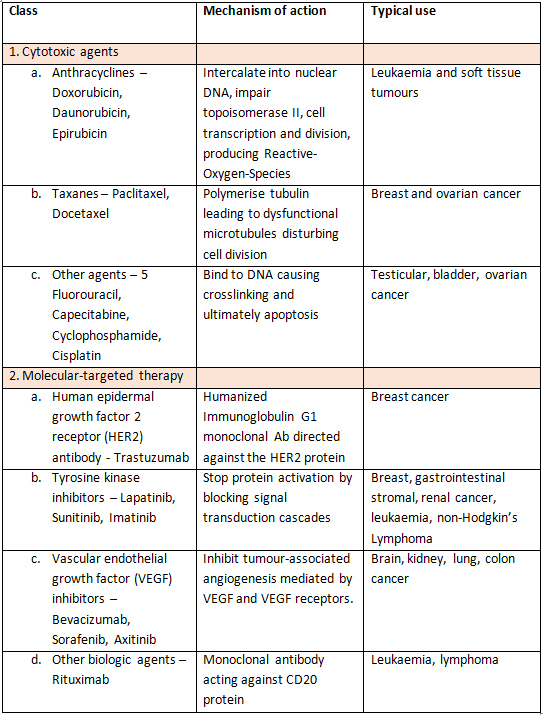 Trastuzumab (Herceptin), tyrosine kinase inhibitors e.g. Sunitinib and Vascular endothelial growth factor antibodies (VEGFs) e.g. Bevacizumab] (Table 1). The cardiovascular side-effects of these agents are varied (Figure 2) and have traditionally been divided into type 1 and type 2 effects although there may be some overlap . Type 1 effects are commonly caused by anthracyclines and result in myofibrillar disarray causing cumulative and dose-related damage. These effects appear to be permanent and irreversible. Type 2 effects are caused by Trastuzumab and are not dose related and there are no ultra-structural abnormalities and the cardiac effects are thought to be reversible. However there is growing evidence that this demarcation into type 1 and 2 effects may be somewhat arbitrary with considerable overlap being present . 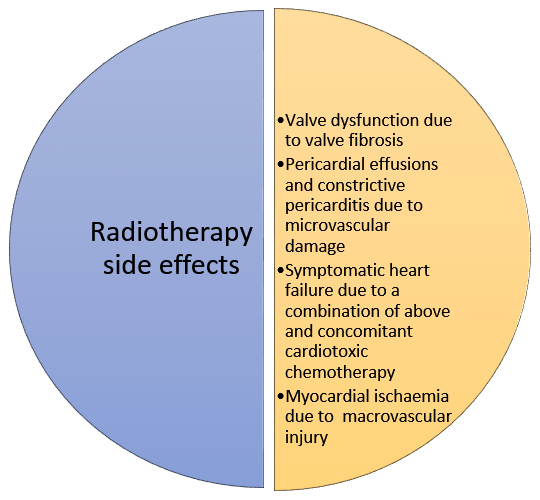 Radiotherapy can cause cardiac damage through macrovascular and microvascular injury (Figure 3). The risk of radiation-induced heart disease is increased with anterior or left chest irradiation, lack of shielding, higher doses and with concomitant anthracycline chemotherapy . Patients who received radiotherapy historically are at increased risk compared to current radiotherapy regimes due to the development of better shielding protection. Cardio-Oncology patients can present in a number of ways . Depending on the cardiac diagnosis (e.g. heart failure versus ischaemia) different investigations and management plans are formulated. Cardiac imaging is the primary investigative modality. With the known effect of chemotherapy on cardiac function, cardiac imaging has been used to monitor this. Traditionally in the USA nuclear medicine (MUGA – multi-gated acquisition), scans have been used to monitor Ejection Fraction (EF) in cancer patients. The predominance of this imaging technique in the USA is due to widespread availability and good reproducibility. However such an approach has considerable drawbacks – namely repeated exposure to radiation with repeated surveillance scans and an inability to offer a more nuanced assessment of cardiac function other than EF. In most other countries echocardiography is the key initial imaging investigation. It is widely available, inexpensive and does not expose the patient to radiation. It can evaluate systolic and diastolic function in addition to valve disease and pericardial effusions. Echocardiography has also been used primarily for surveillance of those undergoing cardio-toxic treatment. Older guidelines focussed on repeated monitoring of EF with a decrease in EF below a certain level postponing or stopping cancer treatment . Changes in EF are late markers in the assessment of cardiac function. EF is a composite marker reflecting longitudinal, radial and circumferential myocardial contractility. A deterioration in any one of these types of contractility can be compensated for by increased contractility in the other two directions. As such the EF may remain unchanged despite deterioration in one type of contractility and is thus an insensitive marker of myocardial function in this situation . In addition, the recommendations regarding the level of change in serial EF measurements that mandate alterations in chemotherapeutic approachx, are close to the coefficient of variability for EF, assessed by routine departmental echocardiography. The use of 3D echocardiographic to obtain volumetric EF calculations is more reproducible, compares favourably with cardiac magnetic resonance EF calculations and is advocated as the preferred echocardiographic method of calculating EFvi. Newer parameters of deformation and contractility hold the prospect of being able to identify cardiac involvement before EF changes, and thus alert clinicians early, before irreversible damage occurs. Candidate parameters include echocardiographic strain imaging, tissue Doppler annular velocities and chamber volumes. Current guidelines recommend strain imaging in monitoring for cardio-toxicityviii. Other imaging modalities have their roles also. Cardiac Magnetic Resonance (CMR) imaging can complement echocardiography by demonstrating the location of focal myocardial fibrosis by late gadolinium imaging and diffuse fibrosis by the newer T1 and T2 mapping techniques . CMR can also identify acute inflammatory changes associated with chemotherapy and can be invaluable in monitoring for the resolution of cardiac oedema in this context . CMR is however limited by availability, cost and patient acceptance, making it unlikely to wholly supplant echocardiography. Computed Tomography of the Coronary Arteries (CTCA) is also a useful investigation especially when assessing the effects of radiotherapy-induced fibrosis and coronary atherosclerosis and has been recommended in European Association of Cardiovascular Imaging and American Society of Echocardiography guidelinesvi,viii. Troponin and Brain Natriuretic Peptide (BNP) levels can be measured during chemotherapy and in case of decompensation. Elevated levels indicate some degree of myocardial cell damage and/or myocardial strain and are prognostic . However studies have not yet been undertaken to determine prospectively if initiating cardio-protective treatment in response to abnormal blood tests has a prognostic benefit. Additional novel markers (ST2, galectin, myeloperoxidase, high sensitive CRP) have also been measured in some studies and risk scores to determine cardio-toxic risk developed . However more work still needs to be done on this front (especially to show a prognostic benefit from using these scoring systems) before they are routinely employed in clinical practice. Patients with chemotherapy or radiotherapy induced heart failure, valve disease or coronary ischaemia should be treated as per standard European and national guidelines, but some registries suggest that cancer survivors may be undertreated for conventional CV risk factors , . The treatment of coronary disease with stents (and the associated antiplatelet agents) may be difficult if cancer surgery or treatment with chemotherapy that may seriously diminish platelet numbers, is imminent. Currently clinicians deal with these situations on an empirical individualised basis, although with national and international registries becoming available, it is to be hoped these important aspects of clinical care may become rationalised. There is limited data on the cardio-protective effect of Angiotensin Converting Enzyme (ACE) inhibitors, Angiotensin Receptor Blockers (ARBs) and beta blockers in patients undergoing chemotherapy , . Their use in this context (e.g. when the EF or strain values drop significantly with chemotherapy but still remain in the ‘normal’ range) is unlicensed. Current trials are investigating this and whether cancer therapy-related cardiotoxity can be prevented – the Multidisciplinary Approach to Novel Therapies in Cardiology Oncology Research (MANTICORE) and Prevention of Cardiac Dysfunction during an Adjuvant Breast Cancer Therapy (PRADA) Trials , . Desraxozane (an iron chelator) has been shown to reduce doxorubicin-induced cardio-toxicity . It may be initiated at the first dose of anthracycline or after a cumulative doxorubicin dosage of ? 300 mg/m2. However its use is licensed in the treatment of only a few cancers and It’s use is not widespread and although a previously a worsening in cancer outcomes was suggested, subsequent studies have not confirmed this potential . Additional work has been done on the cardioprotective effect of mineralocorticoid receptor antagonists and on statins . However randomized control trials are awaited for both of these drug classes before incorporation into guidelines. There is an increased recognition that optimal cardiovascular care for cancer patients can be best delivered through dedicated Cardio-Oncology services. Cardio-Oncology services are now being developed at a number of hospitals in the UK . Given the increased success of oncological treatments the number of cancer patients with cardiovascular problems will increase with time resulting in a greater need for Cardio-Oncology services. Training programmes in Cardio-Oncology are well established in the USA with trainees from both Cardiology and Oncology undertaking these fellowships with the ultimate aim of developing Cardio-Oncology services with Cardiologists and Oncologists working together as a team . Currently only a few hospitals in the UK offer Cardio-Oncology Fellowships. The aim of the British Cardio-Oncology Society (http://bc-os.org/) is to expand training in Cardio-Oncology and ultimately develop formal training programmes. The author is amember of the British Cardio-Oncology Society. Table 1. Mechanisms of action and uses of common cardio-toxic chemotherapeutic agents. HER2 - Human epidermal growth factor 2 receptor, VEGF - Vascular endothelial growth factor. Ghosh, A.K. & Walker, J.M., 2017. Cardio-Oncology – a new subspecialty with collaboration at its heart. Indian heart journal. Yeh, E.T.H. & Bickford, C.L., 2009. Cardiovascular Complications of Cancer Therapy. Journal of the American College of Cardiology, 53(24), pp.2231–2247. Available at: http://linkinghub.elsevier.com/retrieve/pii/S073510970901064X. Suter, T.M. & Ewer, M.S., 2013. Cancer drugs and the heart: Importance and management. European Heart Journal, 34(15), pp.1102–1111. Barac, A. et al., 2015. Cardiovascular Health of Patients With Cancer and Cancer Survivors: A Roadmap to the Next Level. Journal of the American College of Cardiology, 65(25), pp.2739–46. Available at: http://www.ncbi.nlm.nih.gov/pubmed/26112199 [Accessed December 20, 2015]. Lenihan, D.J. & Cardinale, D.M., 2012. Late cardiac effects of cancer treatment. Journal of Clinical Oncology, 30(30), pp.3657–3664. Plana, J.C. et al., 2014. Expert Consensus for Multimodality Imaging Evaluation of Adult Patients during and after Cancer Therapy : A Report from the American Society of Echocardiography and the European Association of Cardiovascular Imaging. , 27560. Bloom, M.W. et al., 2016. Cancer Therapy-Related Cardiac Dysfunction and Heart Failure: Part 1: Definitions, Pathophysiology, Risk Factors, and Imaging. Circulation. Heart failure, 9(1), p.e002661. Available at: http://circheartfailure.ahajournals.org/content/9/1/e002661.full [Accessed January 16, 2016]. Lancellotti, P. et al., 2013. Expert Consensus for Multi-Modality Imaging Evaluation of Cardiovascular Complications of Radiotherapy in Adults : A Report from the European Association of Cardiovascular Imaging and the American Society of Echocardiography. Journal of the American Society of Echocardiography, 26(9), pp.1013–1032. Available at: http://dx.doi.org/10.1016/j.echo.2013.07.005. Bellinger, A.M. et al., 2015. Cardio-Oncology: How New Targeted Cancer Therapies and Precision Medicine Can Inform Cardiovascular Discovery. Circulation, 132(23), pp.2248–58. Available at: http://www.ncbi.nlm.nih.gov/pubmed/26644247 [Accessed December 20, 2015]. Curigliano, G. et al., 2012. 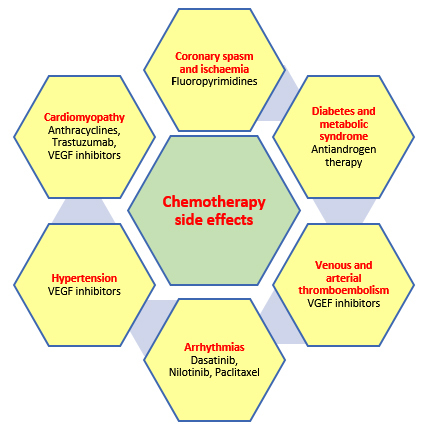 Cardiovascular toxicity induced by chemotherapy , targeted agents and radiotherapy : ESMO Clinical Practice Guidelines. Annals of Oncology, 23(Supplement 7). Abraham, T.P., Dimaano, V.L. & Liang, H.-Y., 2007. Role of tissue Doppler and strain echocardiography in current clinical practice. Circulation, 116(22), pp.2597–2609. Available at: http://www.ncbi.nlm.nih.gov/pubmed/18040039. Neilan, T.G. et al., 2013. Myocardial extracellular volume by cardiac magnetic resonance imaging in patients treated with anthracycline-based chemotherapy. The American journal of cardiology, 111(5), pp.717–22. Available at: http://www.scopus.com/inward/record.url?eid=2-s2.0-84873723130∂nerID=tZOtx3y1. Thavendiranathan, P. et al., 2013. Cardiac MRI in the assessment of cardiac injury and toxicity from cancer chemotherapy: a systematic review. Circulation. Cardiovascular imaging, 6(6), pp.1080–91. Available at: http://www.ncbi.nlm.nih.gov/pubmed/24254478 [Accessed April 9, 2016]. Cardinale, D. et al., 2004. Prognostic value of troponin I in cardiac risk stratification of cancer patients undergoing high-dose chemotherapy. Circulation, 109(22), pp.2749–54. Available at: http://www.ncbi.nlm.nih.gov/pubmed/15148277 [Accessed November 25, 2015]. Herrmann, J. et al., 2014. Evaluation and management of patients with heart disease and cancer: cardio-oncology. Mayo Clinic proceedings, 89(9), pp.1287–306. Available at: http://www.pubmedcentral.nih.gov/articlerender.fcgi?artid=4258909&tool=pmcentrez&rendertype=abstract [Accessed March 29, 2016]. Weaver, K.E. et al., 2013. Cardiovascular risk factors among long-term survivors of breast, prostate, colorectal, and gynecologic cancers: a gap in survivorship care? Journal of cancer survivorship : research and practice, 7(2), pp.253–61. Available at: http://www.pubmedcentral.nih.gov/articlerender.fcgi?artid=3756807&tool=pmcentrez&rendertype=abstract [Accessed February 16, 2016]. Meacham, L.R. et al., 2010. Cardiovascular risk factors in adult survivors of pediatric cancer--a report from the childhood cancer survivor study. Cancer epidemiology, biomarkers & prevention : a publication of the American Association for Cancer Research, cosponsored by the American Society of Preventive Oncology, 19(1), pp.170–81. Available at: http://cebp.aacrjournals.org/content/19/1/170.abstract [Accessed February 16, 2016]. Seicean, S. et al., 2013. Cardioprotective effect of ?-adrenoceptor blockade in patients with breast cancer undergoing chemotherapy: follow-up study of heart failure. Circulation. Heart failure, 6(3), pp.420–6. Available at: http://www.ncbi.nlm.nih.gov/pubmed/23425978 [Accessed December 6, 2015]. Cardinale, D. et al., 2006. Prevention of High-Dose Chemotherapy-Induced Cardiotoxicity in High-Risk Patients by Angiotensin-Converting Enzyme Inhibition. Circulation, 114(23), pp.2474–2481. Available at: http://circ.ahajournals.org/cgi/doi/10.1161/CIRCULATIONAHA.106.635144. Pituskin, E. et al., 2011. Rationale and design of the Multidisciplinary Approach to Novel Therapies in Cardiology Oncology Research Trial (MANTICORE 101--Breast): a randomized, placebo-controlled trial to determine if conventional heart failure pharmacotherapy can prevent trastuzu. BMC cancer, 11, p.318. Available at: http://www.pubmedcentral.nih.gov/articlerender.fcgi?artid=3171383&tool=pmcentrez&rendertype=abstract [Accessed November 25, 2015]. Heck, S.L. et al., 2012. Rationale and design of the prevention of cardiac dysfunction during an Adjuvant Breast Cancer Therapy (PRADA) Trial. Cardiology, 123(4), pp.240–7. Available at: http://www.ncbi.nlm.nih.gov/pubmed/23207160 [Accessed November 25, 2015]. Cvetkovi?, R.S. & Scott, L.J., 2005. Dexrazoxane : a review of its use for cardioprotection during anthracycline chemotherapy. Drugs, 65(7), pp.1005–24. Available at: http://www.ncbi.nlm.nih.gov/pubmed/15892593 [Accessed February 16, 2016]. Swain, S.M. et al., 1997. Cardioprotection with dexrazoxane for doxorubicin-containing therapy in advanced breast cancer. Journal of clinical oncology : official journal of the American Society of Clinical Oncology, 15(4), pp.1318–32. Available at: http://www.ncbi.nlm.nih.gov/pubmed/9193323 [Accessed February 16, 2016]. Akolkar, G. et al., 2015. The role of renin angiotensin system antagonists in the prevention of doxorubicin and trastuzumab induced cardiotoxicity. Cardiovascular ultrasound, 13, p.18. Available at: http://www.pubmedcentral.nih.gov/articlerender.fcgi?artid=4393607&tool=pmcentrez&rendertype=abstract [Accessed December 20, 2015]. Seicean, S. et al., 2012. Effect of statin therapy on the risk for incident heart failure in patients with breast cancer receiving anthracycline chemotherapy: An observational clinical cohort study. Journal of the American College of Cardiology, 60(23), pp.2384–2390. Available at: http://dx.doi.org/10.1016/j.jacc.2012.07.067. Cubbon, R.M. & Lyon, A.R., 2016. Cardio-oncology: Concepts and practice. Indian heart journal, 68 Suppl 1, pp.S77–S85. Available at: http://www.ncbi.nlm.nih.gov/pubmed/27056658 [Accessed April 11, 2016]. Okwuosa, T.M. & Barac, A., 2015. Burgeoning Cardio-Oncology Programs: Challenges and Opportunities for Early Career Cardiologists/Faculty Directors. Journal of the American College of Cardiology, 66(10), pp.1193–7. Available at: http://www.ncbi.nlm.nih.gov/pubmed/26337999 [Accessed April 24, 2016]. Arjun has completed his MBBS from Calcutta University in 2002 with a Gold Medal awarded in 2000. 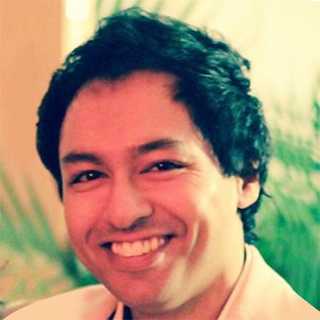 He moved to the UK in 2004 completing the MRCP (UK) in 2006 and started specialist registrar training in Cardiology on the North West London rotation in 2007 completing his training in 2016 with the award of MRCP (Cardiology).